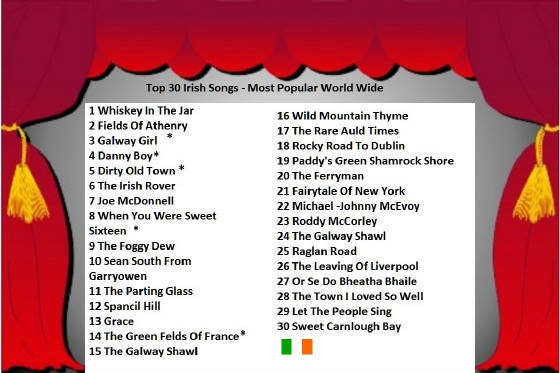 Most Popular Irish And Folk Songs. from now on I will be adding the updates here instead of the homepage. I also will add relevant information regarding the songs and songwriters and general information about the folk and ballad scene in Ireland and beyond. depending on the time of year and events taking place. 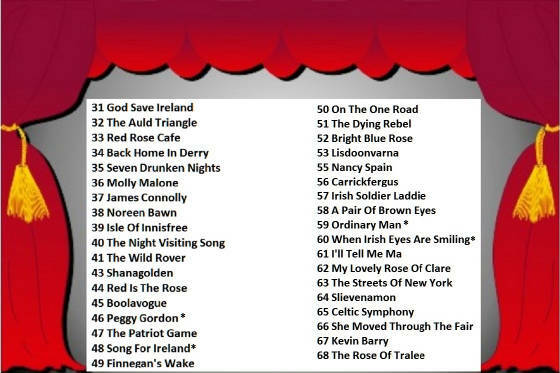 For exampl during the month of December Fairytale Of New York and Christmas 1915 are the more popular because they are Christmas songs During rugby matches Ireland's Call would be a hugh hit, but in general the ones above are the most popular. There's a list compiled below naming the best loved Irish folk songs of all time, well in the past 30 years or so. It's no surprise that The Dubliners made it into the chart on over 20 occasions considering they have been playing music for 50 years. It took me several months to compile the list and was quiet surprised at the songs that made the top spots and also at the one's that didn't make the top 100 at all. Generally when we say ''Irish Songs'' we refer to folk and ballads, so the pop and rock chart toppers fall into a different music genre and I leave that list to those with more experience in that field than me. Whiskey In The Jar by The Dubliners, An old Irish war song sang the world over and still as popular as ever. Brian Flynn who is a guitar teacher teaches you how to play the song in the key of C. It's very easy to follow.On youtube this songs ranks as the No. 1 Irish folk song of all time. One version by The Dubliners has a view count of 6,426,339 as of January 2013. A second version has 3,206,247 views . A Tin Lizzy Versions has a count of 613,514, and another live version by the same group has 8,184,682, so clearly it's the top folk hit of all time going by those stats. The Green Fields Of France, an anti war song by Scotsman Eric Bogle. About WW1 Sang by The Fureys. There's a download tab. version for this song if your intrested in picking the notes instead of strumming. As of January 2013 this song on youtube has hits over 10,000000. That's just counting 10 different versions by different bands/singers. The Night Visiting Song by The Dubliners featuring Luke Kelly singing his final song before departing. Considering his long years as a singer, Luke kept his best until last. There a video to teach you how to play this one, it's by myself and it's handy enofe to play. Grace by Jim McCann. A love song about Grace Gifford and Joseph Plunkett set the night before Joseph was executed in Kilmainham prison in 1916 for his part in the rising. For the past 10 years this one has been one of the most popular songs on the site. Between the Wolfe Tones and Jim McCann it has over a million youtube hits and rising. Galway Girl, a modern day love song by Steve Earle and Sharon Shannon which has now become the most popular Irish song in the last twenty years, well almost. There is sheet music for this one for those playing the lead. The youtube views for this one are over 10,000000 as of Jan. 2013 for various versions of either Steve Earle or Sharon Shannon's versions. This has got to be the most covered song of all time, I counted 150 versions by musicians playing various instruments on youtube. Anthing from guitar to mouth organ. The Ferryman written by Pete St.John and first played by The Dublin City Ramblers has now become an all time favorite at ballad session around the world. It's all about the men who used to ferry people across the River Liffey before all the new bridges were built. Dirty Old Town is known all over the world, written by Ewan McColl and brought to Ireland by Luke Kelly. The Dubliners have being singing it for 50 years. You'll hear it sang in most ballad session in Ireland and Britain. There's a refrain after every 4 line verse and chorus which makes it easy to remember. The Red Rose Cafe as sung by The Fureys And Davie Arthur is centered around a small cafe in Amsterdam where nobody ever goes to work and they meet up each day for to drink and sing, my kind of people, sure there's no point in working if you cant enjoy the fruits of your labour. Back Home In Derry which was written by Bobby Sands while locked away in Long Kesh and recorded by Christy Moore. The song details the voyage to Australia to serve their time in a penal colony and the conditions of the ships that transported them their. Sweet Sixteen is a love song brought back to life by The Fureys And Davie Arthur, written 100 years ago by American James Thornton. Included are the ''Letter Notes'' of the music which are suitable for all lead instruments including whistle and mandolin. Red Is The Rose which I recorded myself is an old traditional song. I learned it from Tommy Makem, it's a love song and the tune is most likely of Scottish origins. There's also a video lesson for playing the tin whistle, it's in the sheet music section. Let The People Sing by The Wolfe Tones is a cry to the powers that be to stop harassing Irish people for singing their songs and stories which forms a large part of their culture. This song is from the album of the same name and is regarded by their fans as their finest record ever made. The Fields Of Athenry, words and music by Dublin songwriter Pete St. John and sang by Paddy Reilly is about The Great Hunger that spread throughout Ireland from 1847 to 1851 and centeres around the Town Of Athenry in County Galway. Video tuition included for guitar. Ronnie drew takes the lead singing The Merry Ploughboy. A live version from 1974 with Luke Kelly doing the backing vocals in a different voice pitch. Amhrán na bhFiann The National Anthem of Ireland Includes the lyrics, sheet music and video. The 15 songs here are not necessarily in the order of popularty on the site. These are the top most popular Irish songs of all time. I have been collecting statistics from various locations for a number of years and these songs constantly show up in the stats. The information on how I compiled the list came from Youtube hits, Google Analytics, Statcounter and above all attending live music sessions. The stats. don't reflect what Irish songs are most popular in Ireland but worldwide. There are a few surprises I wouldn't have thought of and a lot of obvious songs you would expect. They would not be my top 100 of all time but they have been the most searched and listened to over the last 12 years on this site.Fluctuations will naturally appear at certain times of the year. An example of this is during the weeks around Christmas time when more searches are done for Christmas songs or when there are football / rugby matches taking place and people want to learn the words. Another example is when there's a new folk song released which doesn't happen very often, when Christy Moore released My Little Honda 50 a lot of searches are done for that particular song. 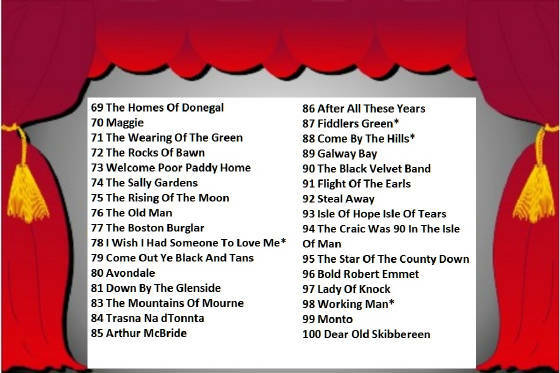 In the above top 100 songs the * symble represents a song that was not written by an Irish person but is regarded by many people to be an Irish folk song. I'm not going to debate what's an Irish song and what is not. It may surprise many visitors to the site to learn that many of our most popular songs are banned from the airwaves. Songs like Sean South, James Connolly and The Dying Rebel, they have been banned for over 40 years now. You may hear a few of them on regional radio but not on our national broadcaster R.T.E. or commercial radio or television. In 2016 there will be a large commemoration to mark the 100th anniveration of the 1916 rising. The government will spend a considerable amount of money on this event to honor the man and women who gave their lives to gain independence for Ireland. The media will also play it's part in the commemoration and no doubt say how great these man and women were but the same media won't play the songs that were written about these people who gave their lives for their country. The same government forbids these songs to be thought in schools and encourages radio and t.v. to keep these songs off the air. I have being pushing and coaxing radio presenters for years to get folk songs into mainstream play lists. Some have helped me out and I thank them. As for the others ? I'll keep at them. This information is free to use for schools and research. If it's to be put on another website all I ask is a link back to this page. it would be still sitting at home and would never see the light of day. Or if Gerry had recorded it and placed it on youtube it would probibly get a few hits and fade away because Gerry wasn't as well known as Finbar. Plus the fact that his song was on national television. Recently a man sent me a song he had written and wanted it included here on the site. It's called ''The old wino that sleeps on the quay'' , I thought it was excelent. Several thousand people have seen it here on this site but that's only because this site gets a massive amount of traffic. I have no doubt that if a famous singer like Christy Moore decided to record this Thomas Keatley song it would be an instant hit record. The same applies to the couple of hundred others who sent me songs in the past 12 years. Lets change the situation a little bit. Say a well known band or singer included a track on their latest album and the song was really bad. That same track would become famous just because the singer was well known. I'm not just talking folk music here, the same applies to all kinds of music. We have all heard really crap records and wondered how the heck did that make it onto the radio, well the average D.J. will play anything once it's by a well known band. written in 1910, according to Wikipedia it was recorded 58 times in the last 100 years. I don't know where Wikipedia get their information from but it was recorded over 100 times in America along and at least 50 singers in Ireland have recorded it. The man who claimed he wrote it never had to work another day in his life and lived off the royalties. It was a bit different in Ireland, if you wrote a song you got it printed and The Ballad Singer would bring it around the towns of Ireland selling the printed lyrics. He's first sing the song to let you hear what you were buying and to give you a listen to the air of the tune. But that was then and this is now and it's much more difficult to have a hit record nowadays. A small amount of bands who work hard on the pub scene and write their own music will make it. But they are few and far between, and it's not as if there are record company scouts doing the rounds checking for talented bands anymore. Thousands of young and old enter these competitons like The X Factor hoping for success. Very few make it and of the few that do make the final their glory is usually short lived. Usually a great song will have three or four verses and a chorus. I say usually but the Danny Boy song had no chorus and was still a massive hit. If this song was written today I'd bet it wouldn'd stand a chance of getting radio time. It was a different era with the general public having a higher attention span when it came to music. Another song with no chorus was the Eric Bogle hit ''The Green Fields Of France'' , this ballad like many others told a good story that is encaptivating to the listener. I remember listening to an interview with the singer / songwriter of The Kinks, Ray Davies who said that anytime he wrote a song that had a ''Riff'' in it it became a hit record and when he left the riff out the record didn't sell as well. Shane MacGowan from The Pogues must have heard the same interview because most of his writing include a riff. So there you go, that's another tip.